I had always felt a generous amount of a thick cream like Nivea was all that my hands need. Never bothered with anything else specifically for the nails. Perhaps not surprisingly, my cuticles had always been a bit dry. This is the first cuticle butter I have tried (am going to just ignore the TBS Almond Oil Cuticle Pen). 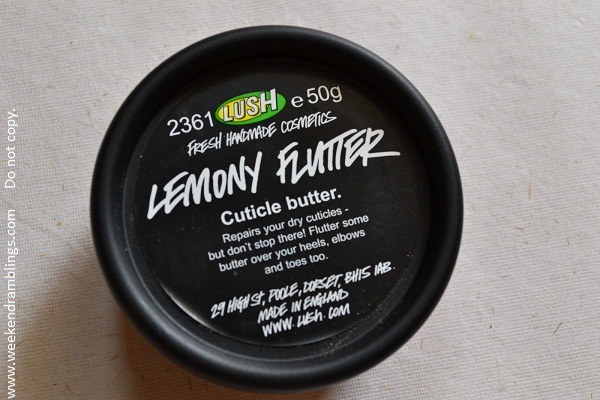 I don't know what made me pick this up - apart from my obsession with Lush, that is :P :P No complaints, though, because this is GOOD. Lemony Flutter is lemony yellow coloured and smells very lemony too - fresh lemon infusion is the first ingredient in the list. The consistency is like a thick balm. I just touch my finger on the surface, and the amount it picks up (or rather, gets stuck on my finger) is all I need for each nail. I have no idea when I will empty this tub! I prefer taking a bit of time and applying properly on each nail because the results are worth it. My cuticles have never ever been dry since I started using this. As with any skincare product, regular use gives the best results. When I do get lazy and skip, I notice a difference within a day or two. 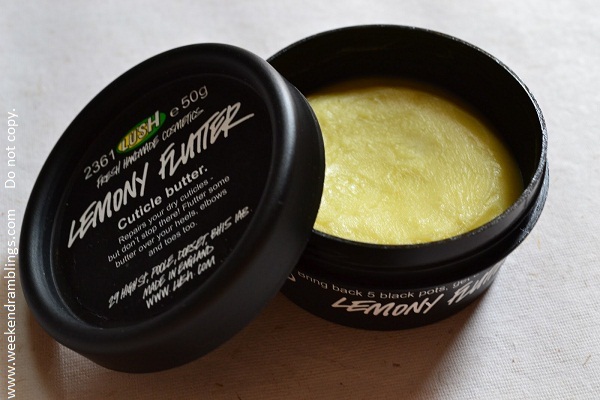 I tried this on my elbows (as Lush suggests), but I didn't feel it did anything much. 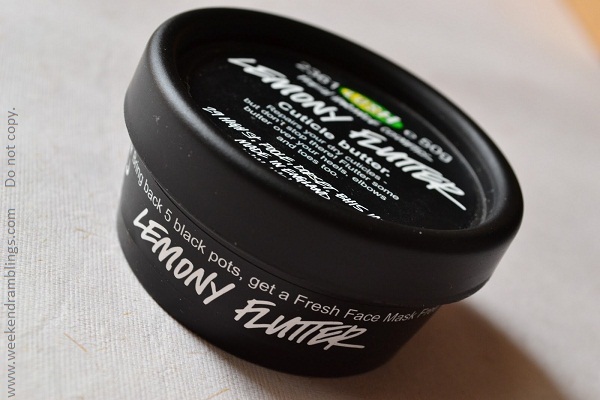 An added incentive for picking this product is it comes in a black tub; return 5 black pots, and you get a fresh face mask of your choice free. The shelf life of about a year is hopefully long enough because, as I said earlier, I need a very small amount and it will be a long while before I finish the 50 g.
My rating: Awesome! I would give it all the stars in the world because it works, and this tub will last me a long long while. Awesomme???????? Coooooooool..This seems to be like a must have I think!! :D :D And good morningggggggg...I hope you are done with your work and sleep!! How you feeling now? Jomol - send me your oriflame haul along with the transparent pouches. hehehe...wht fun...i can imagine....wht plans tomo??? :D Pros and cons - am VERY happy I got to stay, would have taken an hour or more to reach office..another hour or two to find an unoccupied system that was not spoiled..is such a waste of time. a frend of mine suggested som instant glow face wash from lush.. do u knw abt it????? 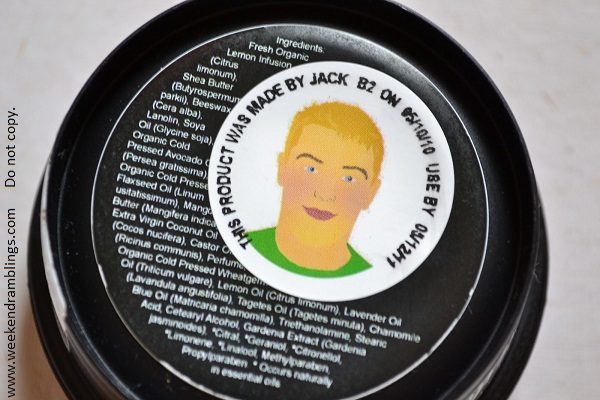 There is Fresh Farmacy - is good for oily skin. The other one is a black one I have not tried..but that is supposed to be good for a glow.. Hmm..I think you should use regularly..like how you can't expect moisturizer effect to last if you don't use it na..that way..and I tho wash my hands so much in our horrible hard water...but I apply this only once a day and usually at night. I did a very dirty thing. I plucked my cuticles and now my fingers are swollen. :| As of now just putting moisturiser , i need to pick something up..